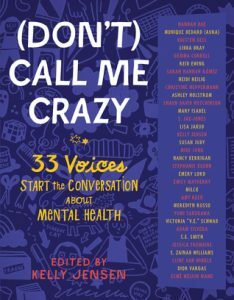 (Don’t) Call Me Crazy is a collection of essays, poems and drawings that discusses different aspects and experiences of mental health. The 33 collaborators come from various backgrounds, including authors like Libba Bray and Victoria Schwab, actress Kristen Bell, and former figure skater Nancy Kerrigan. The book is broken down into five chapters of essays that deal with similar topics. The first seeks to define the word “crazy” in terms of each individual’s personal experience and their relationship to the word. The second discusses our culture’s stigmas surrounding mental illness. The third discusses addictions and eating disorders, while the fourth addresses anxiety and depression. The book finishes with a discussion of recovery and healing. (Don’t) Call Me Crazy is an important work for teenagers and adults alike. No matter if one has personal experience with mental illness, knows someone living with one or has no experience with mental illness, everyone can gain something from the book. Whether to make a personal connection or inspire a better understanding, the perspectives brought forth by the collection show the multitude of different aspects of mental health and show that every person’s experience is different. No one’s experience with mental illness is exactly like another’s, but the book may provide comfort to those struggling with their own. (Don’t) Call Me Crazy inspires an important discussion about a topic that many in our society find too uncomfortable to talk about. It is, however, becoming vital that we engage in open conversation about mental health. Collections like (Don’t) Call Me Crazy aid in that conversation, especially for teens.